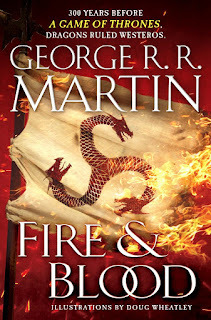 No, it's not The Winds of Winter - my 6-year-old will likely have started reading and caught up with the series before that's released - but it is something (relatively) new in A Song of Ice and Fire. Plus. as Martin points out on his blog, "Oh, and there are dragons too. Lots of dragons." This sounds interesting. But seriously, finish GoT!!!! I'm curious about this one because I love dragons. I like the HBO series a lot and bought several of the books after watching the first season but I refuse to start them until he releases the next one. If he had time to do this, didn't he have time to finish Winds of Winter? Gotta admit, I had the same thought as Barb when I first learned of this book. I still might take a look, but I really wish he'd focus on the series. I have just started watching the Game of Thrones, it was only 2 days ago my hubby said it'd be great to know more about the Targaryens.